The Data Explorer plugin allows you to make SQL queries against your live database, allowing for up-to-the-minute stats reporting. After installing the plugin, head to /admin/plugins . Click on the “Settings” button, and turn on data explorer enabled, then return and reload the page. There should now be a tab in the stacked nav called “Data Explorer”. Select it or head to /admin/plugins/explorer , then use the + , Import or Run Query buttons to get started. 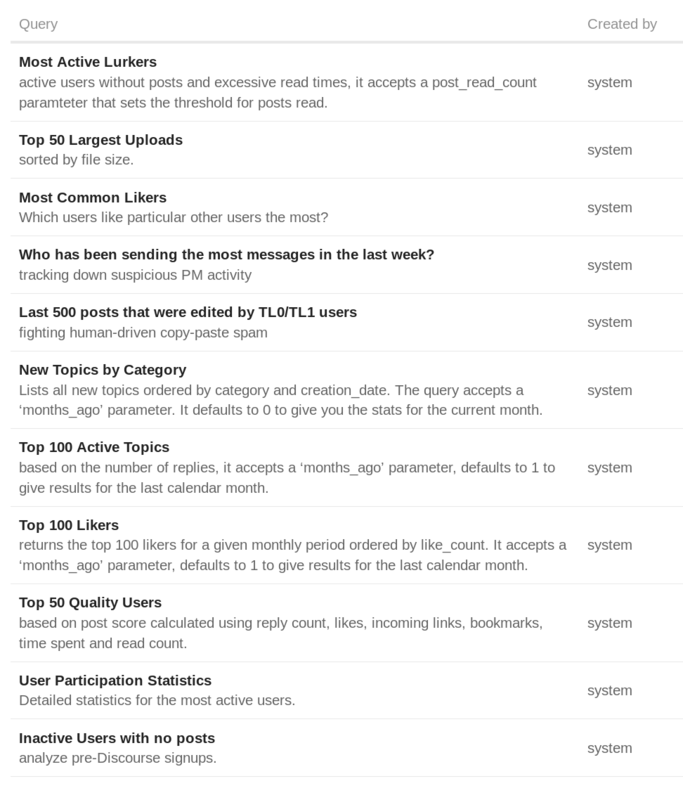 On a fresh install, the data explorer now ships with a bunch of useful queries that can help you draw insights from your forum’s activity. Open any query and click Run Query to try it out. Here's what the stock queries look like. If you have an awesome query that you want everyone to have, make a PR just like this one. Default queries cannot be edited, feel free to copy the sql and paste it into a new query if you’d like to modify them. For an example, let’s import one that I wrote. 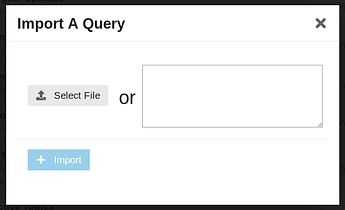 Download this file, then open the import dialog and select the file to be uploaded or paste the query in the text box. Click Import to save it and then click Run Query to see the results. I don’t know any SQL, where do I find more queries? Our community has got you covered! 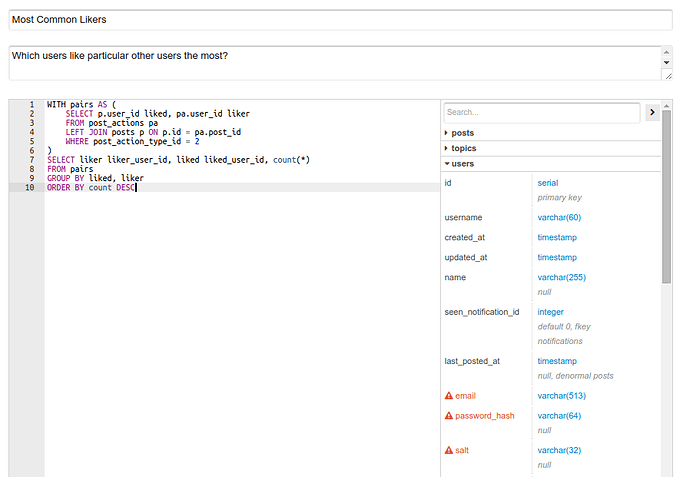 Import as many queries as you like from here: What cool data explorer queries have you come up with? The top two boxes are the name and description of the query. 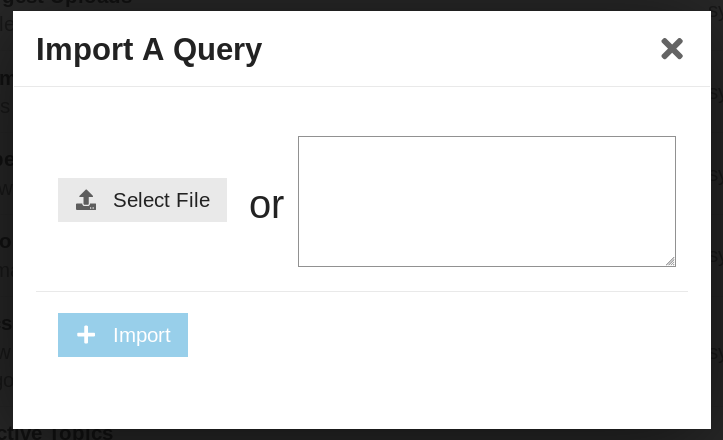 The name is what you’re selecting in the dropdown box, and the description should be used for things like explaining what to put in the query parameters or to describe what data is being queried. The left pane is where you write the SQL query. Minor syntax highlighting and checking is provided. The schema explorer is on the right side of the writing pane. Note the red column names with a warning symbol, such as email , password_hash , salt - these are “Sensitive” columns. Try to avoid querying them if possible, reconsider querying them if you are in a public location, and definitely do not post screenshots of queries checking those columns without thinking about what you’re doing first. Lets modify our example by using a parameter instead of hard-coding values. If you declare a variable as shown below, a text field will show up where you can input different values! Try it out! If you’ve accumulated too many awesome queries, no problem! The search bar can help you filter through titles and descriptions. If there are more than 1000 results, Run Query will return only the first 1000. Clicking Export will let you download all the results with a much higher limit. 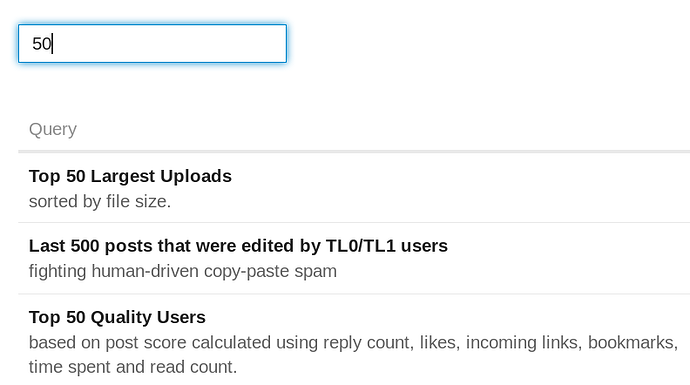 If you’re on a hosted Discourse forum and the data explorer doesn’t show up at /admin/plugins, email us at team@discourse.org to ask us to add it for you. For self-hosted discourse forums, follow the Install A Plugin guide using https://github.com/discourse/discourse-data-explorer.git . How do I download a record of top posts or most clicked links? How to look up a user based on a user_id? How to measure active users? How can I email all recently active users? Tags: how can admin see who is following what tags? How do I clear Warnings? Exporting all Topic titles and IDs? Is there a Data Explorer for Dummies article somewhere? Tracking referrals? Encouraging users to invite others? Maximum Number of Search Results? Working with plugin_store_rows with API, Possible? Is it possible to keep the votes history of a poll? Can I access my Discourse forum database? How do I get a list of all users from the API? What would you like to see on your Discourse 2.0 Admin Dashboard? Discourse disk space limits per user? Poll: Export poll results in CSV for quiz creator? Any way to NOT send emails when a topic category is changed? A way to see full list of users granted with a certain badge? Can I make a plug-ins to view a certain group of people? Sorting all users by total posts? Possible to run a report for most posts within community? Which user has the most badges? Is there a log of user visits? The metrics on dashboard, do they include activities from administrators? Group forum members based on topics viewed? 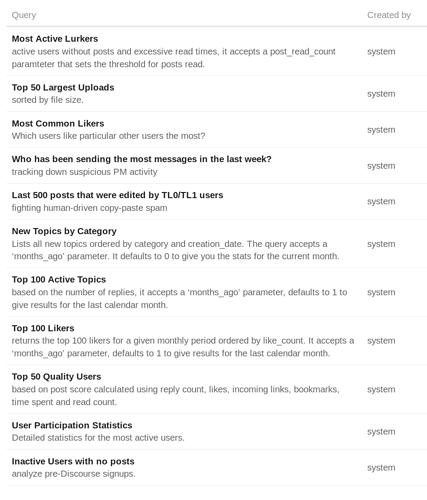 Discourse - What do admins see on the Analytics dashboard? How do I see Facebook signups? 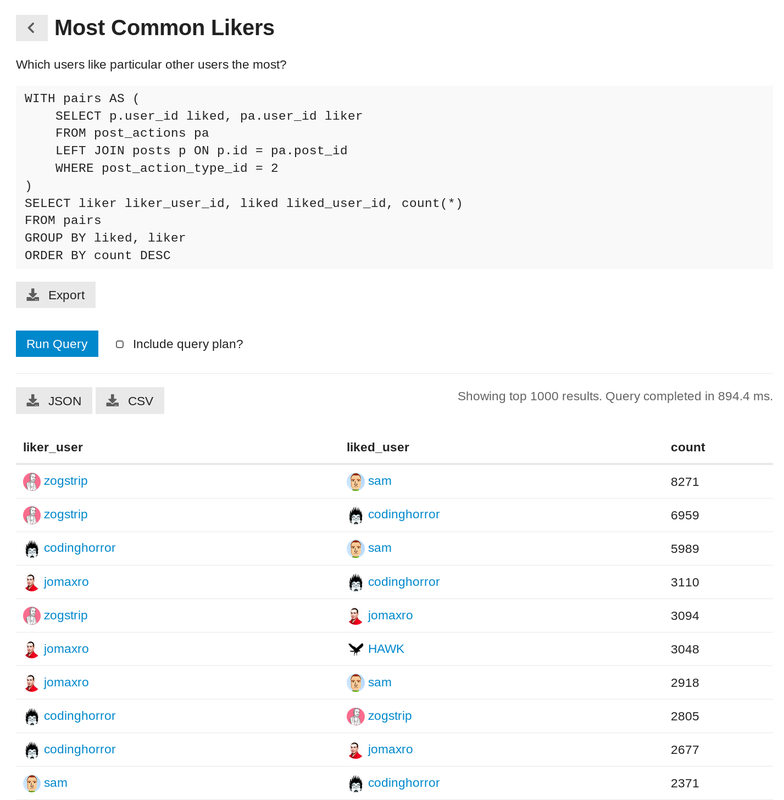 How to check the uniqueness of users in "hot link" badge? A post was split to a new topic: Find old topics with images? Please post replies to the #plugin:data-explorer category. Great job on this plugin! It reminds me of a plugin from the vB world called WebTemplates - it consisted of two parts (WebTemplates and WebQueries), the WebQueries side is basically like your Data Explorer Plugin! 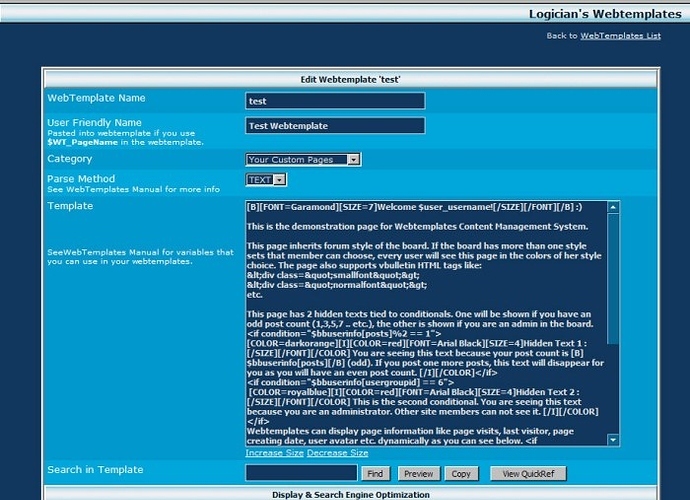 The WebTemplates part is where you can create pages to use saved queries from the WebQueries section. Towards the bottom you can specify which queries you want available for that page - then in the fields above you specify the HTML and where the result of those queries would show. We used this on a vB site to power pages like homepage, news homepage, articles homepage, etc then each news item or each article was simple a forum thread that was styled differently for the first post and subsequent posts (using simple statements like if $post == 1 etc). So the entire site was powered by vB. I’d love to see something like this for DC. I reckon it could take on the publishing world quite easily!! Anyway just posting here in case it’s of interest to you. Use the download buttons to increase the cap to 1000000 (1 million), or if you need more than that, use a custom program that will process the results as they get returned. Brilliant work @riking @rishabhn and others. I love the flexibility and insight this tool gives to our admins. Discourse is technically so far ahead of other forum software competitors it’s not even a race anymore. Let’s say it wants these results to appear in the user’s profile? How do I do it? What code should I paste and where? You won’t be able to put anything in the user profile using data explorer plug-in. You will need to create a custom plug-in to accomplish what you are describing I believe.